Plotagon lets you create a 3D animated actor in just a few clicks. Choose from a huge library of outfits, hairstyles and different looks or get even more from out built in store, where new content is added every week. It has never been more easy or fun to animate yourself. Plotagon Story is so intuitive that anyone can learn to use it in minutes. When you are finished, you can export your movies as MP4 files to use as is, or use them as clips in larger movies. Plotagon offers over 200 scenes available for in-application purchase, all created by our in-house Art team. Plotagon lifelike digital voices from the Acapela Group. American English voices Rod and Karen come standard, and then you purchase adult and child voices from popular languages like French, Spanish, German, Swedish, and more! Which Plotagon version is right for you? Plotagon Story is ideal for individual storytellers to express themselves with friends or on social media. If you wish to make animated films for your business or advertising-based YouTube channel, then Plotagon Studio may be the right choice for you. Plotagon is a fun application for iOS and Android that lets anyone create animated videos in seconds. Write your story, choose characters, and press play. How do I get Plotagon Story? 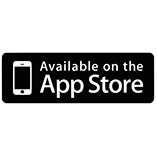 The iPhone and iPad version is available in the App Store, and the Android version is available in the Google Play Store. What does Plotagon Story cost? Plotagon Story is free to download and use. It includes four preinstalled characters and two preinstalled scenes, and you can download additional characters and scenes for free. You can buy even more characters and scenes through our in-application store, but the free items should give you a good start! Plotagon is available for iPhone, iPad and Android. Look at our system requirements to make sure you will be able to use it on your device. What languages is it available in? The user interface of Plotagon is in English, but it is so easy that only a basic knowledge of English is necessary to use the app. 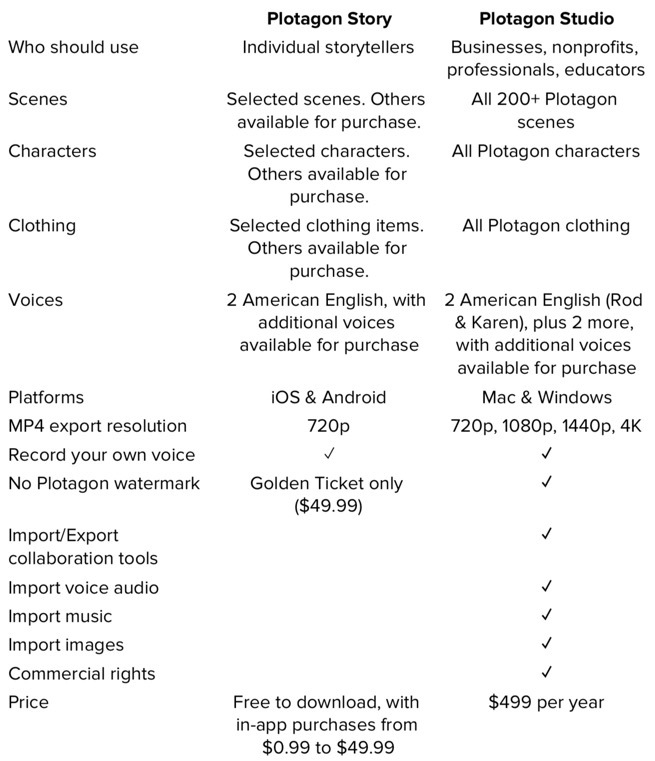 Plotagon comes with male and female English-language digital voices, and we have dozens of other voices in a range of languages available for purchase. Learn more about our range of digital voices from the Acapela Group. You can also record your voice, and the application will sync the characters lips to the sound of your voice in any language. Commercial rights and monetization – can I use Plotagon Story? If you plan on creating videos for business or commercial purposes we recommend that you use Plotagon Studio instead. Plotagon Studio includes advanced content and features as well as commercial rights to the movies you make. How do I buy additional characters and scenes? On iPhone and iPad, you buy characters and scenes as In-App Purchases using your Apple ID. 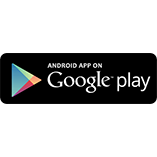 On Android you use your Google Play Store account. If I buy characters and scenes on one device, can I use them on other devices? Yes you can! Characters and scenes are tied to your Plotagon account, no matter where you bought them. If you are on a new device, log into your account and go to the Store tab and click Purchases and then Restore Purchases. If you can’t remember the password for your account you can get a new one here. Please note that you need an email address connected to your account. If you don’t receive the email with your new password, check your spam filter! How do I publish the videos I’ve made with Plotagon? You can save an MP4 file to your device’s hard drive or camera roll. From there, you can share them with friends, with Facebook, Twitter, YouTube, or other social media or video-sharing services. Can I make animated videos about anything? Who owns what I make with Plotagon? My video is not rendering? We had a bug a while back where some of the music made the app freeze while rendering. Go to your music lists in the app. Scroll to the bottom. Click “download more music”. Do the same for sound effects. This will update the faulty music files. It can take a long time before the render starts, the app starts with rendering the music and the voices so if you have a long video with a lot of music it can take a while. The possible length of your plot varies depending on the device you are using. This is related to the size of the generated video file in combination with the amount of memory on your device. If you want to tell an epic story, try making into shorter episodes instead. A good tip is to restart the app before you render, especially if you have worked on your plot for a long while. Restarting makes sure the app has enough memory to render. Do I have to be online when using Plotagon? You need to be online to log in to the app, and to purchase content. Thumbnails of scenes might be black if you are not online, and if you have not downloaded scenes or clothes they will not be available. But there is no need to be online while you are creating. Why can’t I open my story on another device? Your script and your custom characters are saved locally on your device’s hard drive, which means that you have to continue working on the same device.